In 2014, I went to Altiro Latin Fusion in Geneva, Illinois, at the recommendation of a good friend. At the time it seemed that tacos prepared in exotic fashion were becoming the rage. The visit to that Altiro was the first time I had exotic tacos done right, it seemed. I joked with the owner that they should open a location in Chicago proper in Logan Square. Well, I never thought a suggestion given in jest would be taken seriously. 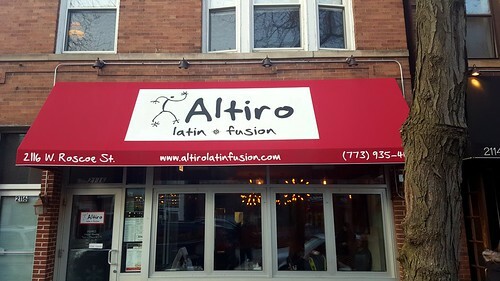 Instead of Logan Square, an Altiro Latin Fusion is now in Roscoe Village at 2116 W. Roscoe Street, a quick ride from Logan Square. I got in contact with my friend who introduced me to the Altiro Geneva offerings to see if he was game for trying out the Roscoe Village location. Being sure to arrive well in advance of the dinner crowd, we had a seat, he starting with a Modelo Dos Equis, and me whetting my palate with an Al Florinda. 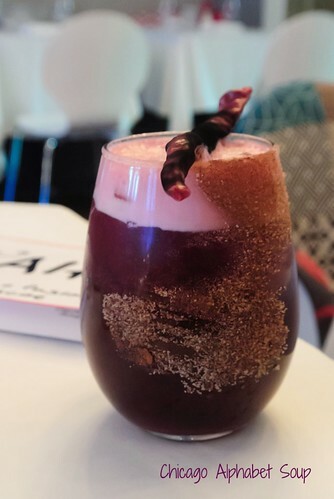 The concoction of hibiscus with bourbon, orange liqueur, orange juice, lime juice and chili de Arbol definitely had me off the a good start. 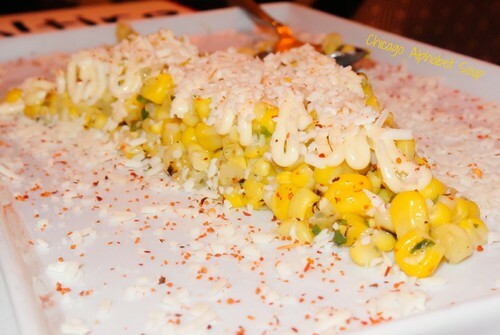 One tapas dish that I enjoyed at the Geneva location and an all-time Mexican favourite is elote. The Al Elitito was not the usual corn on the cob, but was off the cob prepared with garlic aioli, serrano pepper, fresh epazote, onions, cotija cheese, and chile piquin. This may be some of the most addictive corn you will ever devour. Something different we ordered was Ala Papa Brava. 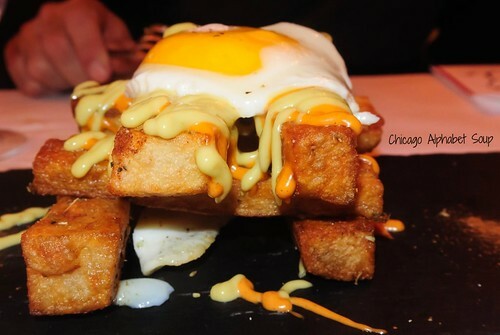 This came as several potato logs, topped with an egg sunny side up and dollops of aioli and poblano sauces. Of all of the Spanish tapas restaurants I’ve gone to that serves papas bravas, Altiro Roscoe Village is in control of setting the bar. Altiro is outstanding when it comes to tacos and this is another area where they’ve set the bar high — for me, that is. We ordered the Al Fundido, which were tacos prepared with sautéed garlic shrimp, Chihuahua cheese, cilantro-lime oil, and escabeche red onions. 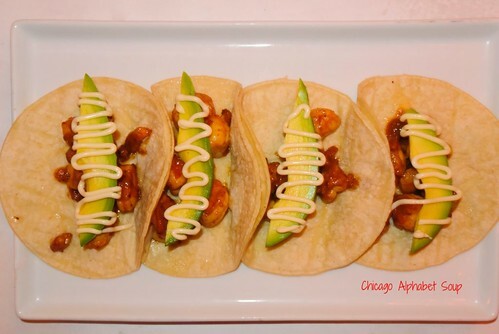 It is easy to forget about ordering tacos with shredded beef, ground beef, pork, or chicken after having it with delectable, plump shrimp ala Al Fundido. In preparation for the final main dish, my friend had another beer and I ordered an Al Pepiño. 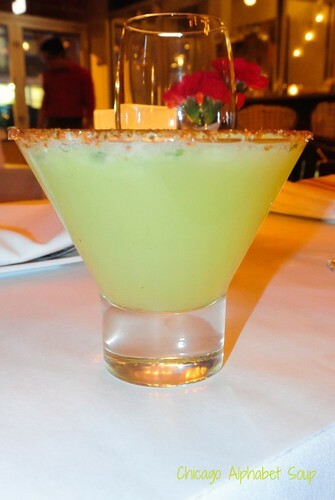 When I said I wanted a spicy drink, the recipe of muddled cucumber, cilantro, jalapeno infused vodka, fresh lime, and agave nectar was sent from the gods, not the bartender. 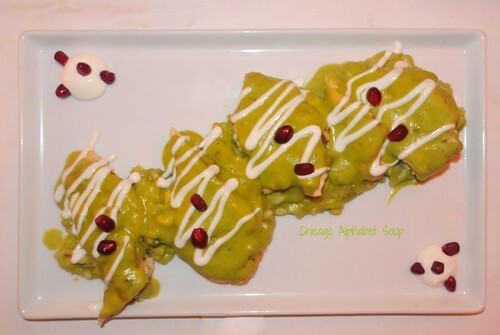 And with the Al Poblano of tender chicken breast over rice in a poblano sauce and accented with pomegranate seeds, my friend and I were too immersed in working the tortillas to scoop the dish that we hadn’t noticed the Damiens and Rhodas having a run of the restaurant. After having stuffed ourselves to near food comatose, we waited before having their version of tiramisu. Move over Italian restaurants because you have competition. There were the usual ingredients, but there wasn’t the espresso and usual dusting of cocoa powder on top. There was Rumchata. 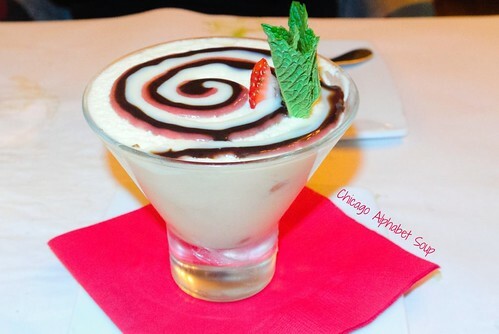 People who say bacon goes great with everything will promptly start saying Rumchata is considerably better with everything after they have some of this tiramisu. I remember the service being about 50 miles past exceptional at the Altiro Geneva location. The Roscoe Village has been open for less than a full year and they’re already well down the stretch with top service. Sending something from the kitchen that is not appetizing clearly is not a part of their formula. Not one item have I had that I did not want to eat to excess after the first bite. 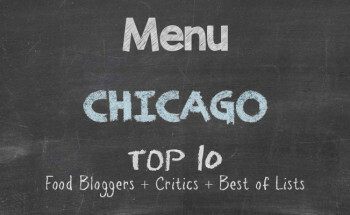 Although I have to go only a few miles to Roscoe Village for a feast of their good food, I’m okay with that. I’m just glad I don’t have to ride the train all the way out to Geneva.